Download Egypt Rankings' first free comprehensive annual review of Egypt's scores in several fields, such as competitiveness, innovation etc. 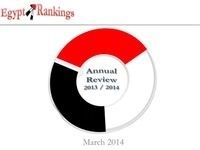 Egypt Rankings, the first research initiative to work on Egypt’s global rankings, released its first comprehensive annual review to give a picture of the country’s key rankings during 2013-2014. It includes indices on Innovation, Competitiveness, Doing Business, Corruption Perceptions, Economic Freedom and other areas. “The report’s prime objective is to provide an integrative view of Egypt’s rankings across the main global indices”; stated Ossama El-Badawy, the co-founder of Egypt Rankings and the main author of the report. The review of rankings on each index also provides a quick assessment of Egypt’s key strengths and weaknesses. The country’s top challenges were institutions, labor market efficiency, enforcing contracts and monetary freedom (with inflation as proxy). In terms of trend, the review of rankings evolution over the previous five years revealed deterioration of Egypt’s global rankings across the five main indices examined, and the notation here is that the perception of corruption witnessed the least loss. Besides the main global indices, other rankings included reference, socioeconomic factors, foreign direct investment, stock market and internet contribution to GDP. All whitepapers are available to you and free of charge. This whitepapers is provided by Egypt Rankings.